This statistic shows the U.S. self-reported consumer spending on a monthly basis for the ongoing year. The survey is conducted through daily telephone interviews among approximately 30,000 adults per month in the U.S. The graph shows the 30-day average for each month to depict an annual trend. 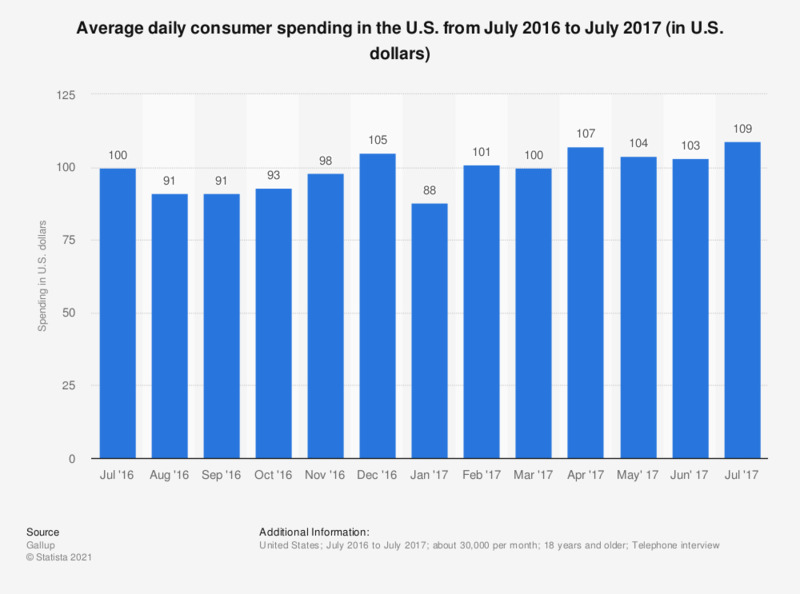 In July 2017, the average daily spending of Americans amounted to 109 U.S. dollars. Gallup's Consumer Spending measure is calculated from responses to a basic question asking Americans each day to estimate the amount of money they spent "yesterday," excluding the purchase of a home or an automobile, or normal household bills. The result is a real-time indicator of discretionary retail spending, fluctuations in which are sensitive to shifts in the economic environment.